Over the past several months here at CDM, we’ve shown with this column that Game Audio has come a long way since the days of C64 bleeps and bloops. This is apparent in nearly all of today’s console games and PC games, which frequently have studio recorded soundtracks, licensed music from a Billboard Top 100 band, or a fully orchestrated score written by a top Hollywood composer. 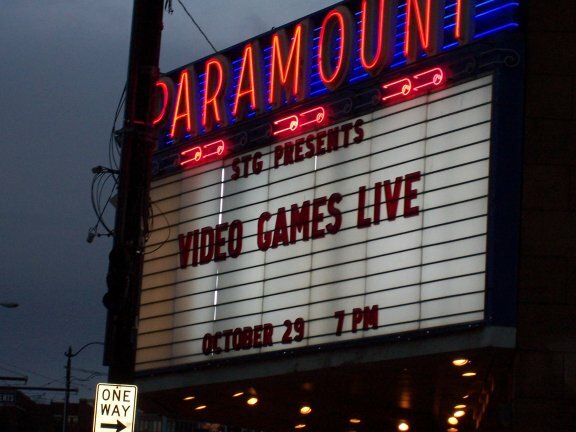 On October 29th, I had the great fortune of being one of the few people in the US to enjoy the ‘next level’ of Game Audio – Video Games Live. The brainchild of renowned game composers Jack Wall and Tommy Tallarico, VGL is a multimedia performance that takes the music out of the games and moves it to center stage. VGL features a live symphony orchestra playing arranged versions of some of the industry’s most popular game soundtracks. The Seattle show took place at the historic Paramount Theater. In attendance were a wide variety of folks from all walks of life. 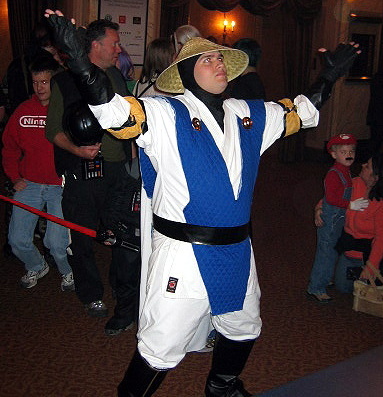 There were plenty of gamer-geeks there (myself included), but there were also families with children no more than 5 years old, and adults easily in their 50’s and 60’s. I made a brief stop at the merchandise booth where I picked up a program, a poster and a T-Shirt for my ladyfriend. Now here’s something you don’t see everyday – the T-Shirts were from American Apparel, a sweatshop-free, US-based clothing company out of downtown Los Angeles. High quality and politically conscious merchandise – and at a reasonable $20. Classy! Upon entering the performance hall, fans could easily tell this was no ordinary concert. The orchestra took centerstage, with a choir lined up on risers behind them. Upon the rear wall of the stage was a giant projection screen, which displayed the VGL logo. The show opened with a medley of classic game tunes. The opening piece can only be called ‘bleep’ or ‘bloop’ – the orchestra was essentially recreating the ‘soundtrack’ of the game Pong. In the background, the projection screen began playing game footage from these classic games, and the orchestra proceeded through a host of tunes including Defender, Tempest, Dragon’s Lair, and several others, with the crowd cheering as popular games came on-screen. Conducted by Jack Wall himself, it was apparent that the players and audience were already having a great time. Each segment of the show lasted anywhere from 5-10 minutes, depending on the game being represented, and each was accompanied by a montage of corresponding game footage. For example, the Castlevania medley, arranged by God of War co-composer Chris Velasco, had classic cuts from the original NES game, as well as more recent sequels seen on Gameboy Advance, DS, and Playstation. In between a few of the songs, Tommy Tallarico came onstage to offer introductions or explain some of the video choices they made. During the Medal of Honor segment, actual WWII footage was shown, rather than game footage. An interesting and moving choice for what was, for the most part, a fun-filled night. There was a brief intermission, during which a progress bar was displayed on the rear screen. At the end of the intermission, the display said, “Push Start (or clap) To Continue…” The audience had fun with that and began to cheer loudly. To kick off Act II, Tallarico came onstage and introduced the first-ever interactive Frogger performance. Two players were randomly chosen from the audience and brought onstage. Each was given 90 seconds to try to get the highest score possible playing the original Frogger, which was displayed on the projection screen. The orchestra accompanied the playing – but the unique feature was that the orchestra was truly ‘interacting’ with the gamplay. Depending on how the player was doing, conductor Wall would move the orchestra to a different section of music – 10 in all – to aurally enhance the gameplay. It was truly a sight and sound to behold, and audience and players alike really seemed to get into the action. In the end, the younger player won, and took home a $2500 Ferrari Laptop. Not bad for 90 seconds of Frogger, eh? the Halo medley – the Halo team, including composer Marty O’Donnell were all present at the show. All told, this was one of the most unique concert experiences I’ve ever had. I’m fairly confident that many in the audience could say the same, and it is unfortunate that lack of corporate support and average ticket sales lead to the canceling of the majority of the tour dates. Some folks have speculated that the tickets might have been too expensive, though the Seattle show had a fairly average price range – from $20-60. As a gamer, musician and a game composer myself, I didn’t balk at the price. I’d much rather pay $60 for a truly unique concert experience than go see the hit-of-the-week pop band in the same venue. Moreover, I’m always on the lookout for ways to support my peers in their endeavors, and if I can get a great show out of it at the same time, well, that’s just icing on the cake. From what we’ve read on the VGL site, it seems that there weren’t many in the industry who believed, as Tommy and Jack did, that such an event could succeed – even though the first concert sold over 10,000 seats at the Hollywood Bowl. The marketing budget was limited without strong support from the game and symphony industries, and as such I think that much of the potential audience was missed. From what I could tell, the Paramount was near capacity, and I’m hoping the Vancouver show had good ticket sales as well. If that is the case, it hopefully means that a strong message will be sent to would-be sponsors of the event. There are high hopes that VGL will tour again in 2006. For those of us with the patience, there was an excellent meet-and-greet session following the concert. I’d estimate that about 100 fans waited in line to meet some of the composers who had come to the show that night. Of course Jack Wall and Tommy Tallarico were there, but also in attendance were Gerard Marino (God Of War), Tim Larkin (the Myst series), as well as Martin O’Donnell and several members of the Halo team from Bungie. I got to briefly meet and chat with each one, and Tim Larkin was generous enough to give me a copy of the latest Myst V soundtrack (hint: it is fantastic!). Tommy and Jack were very gracious to all the fans and encouraged all of us to spread the word about the show. It was a bittersweet night – a fabulous and unique experience, with the sad realization that this show really could have done well across North America with the right marketing and support. We here at CDM wish Jack and Tommy all the best and hope that the game and symphony industries will both see the value of this performance. When the tour finally does come to your city, folks, don’t hesitate in grabbing some tickets. It is a truly unique experience that any musician or gamer is sure to enjoy.